Eggplant has worked its way into the starring role in many a recipe on this site, from pasta to sliders (you’ve got to see this one to believe it) and every taste in between. 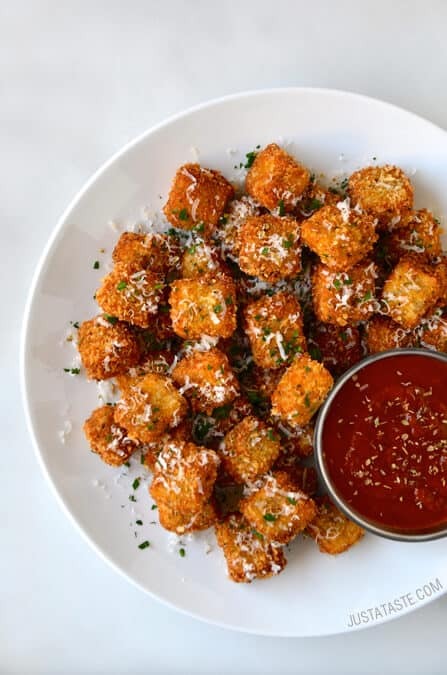 But it’s time to forget the forks in favor of your fingers with this easy, cheesy recipe for Eggplant Parmesan Bites with Marinara Dipping Sauce. 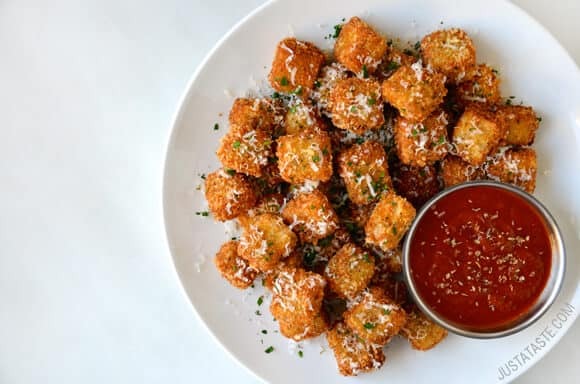 This updated take on the Italian classic features bite-sized nuggets of eggplant coated in Parmesan breadcrumbs and fried to crispy, golden brown perfection. And the dip-worthy complement to this snack sensation? Tangy homemade marinara sauce that transforms from raw ingredients to a saucy slam-dunk in just 10 minutes. 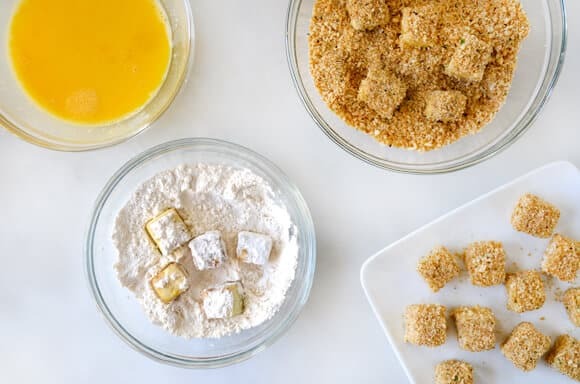 Keep the oil at a boil with a few more of my deep-fried favorites, including Fried Ravioli On a Stick, Italian Arancini (Rice Balls), and more warm, cheesy snacks and sides. Craving more? Sign up for the Just a Taste newsletter for a fresh serving of content delivered every week to your inbox! And stay in touch on Facebook, Twitter, Pinterest and Instagram for all of the latest updates. 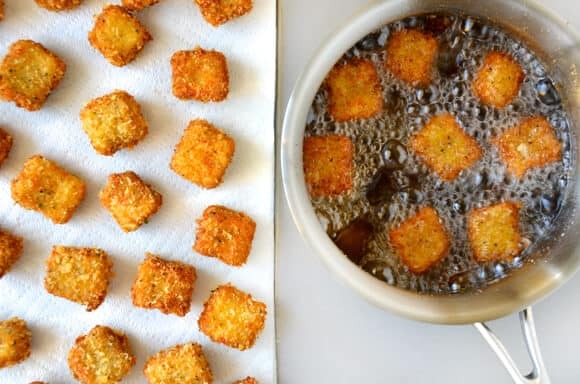 Add three inches of oil to a large, heavy-bottomed pot set over medium heat and attach the deep-fry thermometer. Once the oil reaches 360ºF, add the breaded eggplant in batches, cooking them until they're golden brown on all sides. 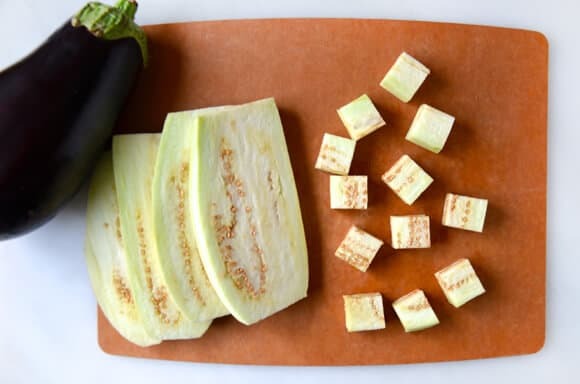 Using a slotting spoon, transfer the eggplant to the paper towel-lined baking sheet and immediately season them with salt. Repeat the frying process with the remaining eggplant, returning the oil to 360ºF between each batch.